After we broke through 836 early last week, my favourite count was dead and I shorted the rally from 827 to 872 and am now ~50% short (853 average). I count the selloff on Monday as a wave a of B (alt i of (i) of 5). 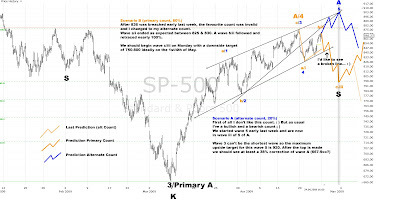 A nice 5-3-5 ZigZag (wave b of B) (with A=C) followed on Tuesday and ended Friday evening. I'm pretty sure that we'll see nice red candles next week : ). Wave c (alt iii) should start on Monday with a downside target of at least 800.